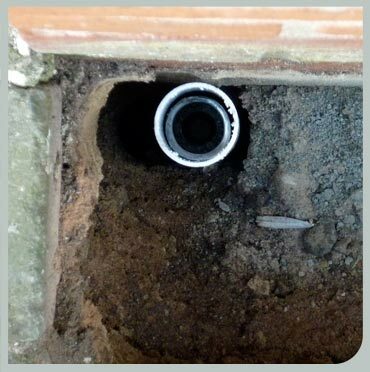 Solving foundation repair problems including subsidence and stabilisation in non-cohesive soils and fills is a specialist service at STRESS, we call it Foundation Rescue. When would you require this solution? Where a building’s foundation or slab has suffered from subsidence as a result of ‘wash-out’, ground movement, consolidation or solution features. View our case study to see it in action. This innovative solution uses a bespoke, patented lance system to form a column of strengthened soil from firm strata at depths of up to 14 meters up to the underside of the footing or slab. The access holes through the footing or slab are 40mm in diameter and the pile formed beneath has a diameter of 500-600mm. The lances are driven to depth using standard small portable percussive tools which allow for working in tight awkward spaces if necessary. The permeation piling systems provide carefully engineered, proven, efficient and economic solutions for underpinning buildings and structures, anchoring retaining walls and stabilising non cohesive soils. The ReFORCE and Geo4RCE permeation engineering piling systems generate their capability from the patented lance delivery system and the specifically engineered geotechnical resin. The quantity, depth and pressure of resin delivery can be controlled exactly which ensures continuity from the pile base to the intimate contact with the underside of the existing footing or slab. STRESS do not usually require any attendence on site when carrying out ReFORCE system installations, however, STRESS do require that the top of the foundation be exposed. Particularly where work has be carried out from the inside of a property. we will also carry out complementary work such as Helifix masonry reinforcement, enabling, heritage masonry repairs etc. as part of the underpinning work.